Hi Friends! I'm super excited to share with you the first in a new series of videos I'm creating - Let's Jam! 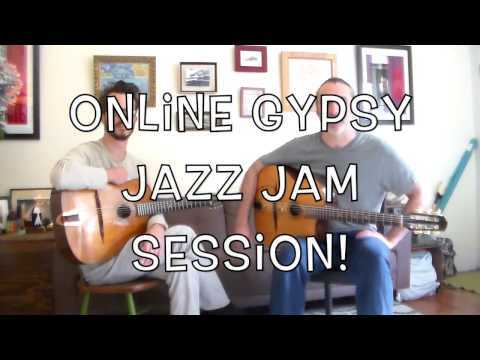 Online interactive gypsy jazz jam simulator! 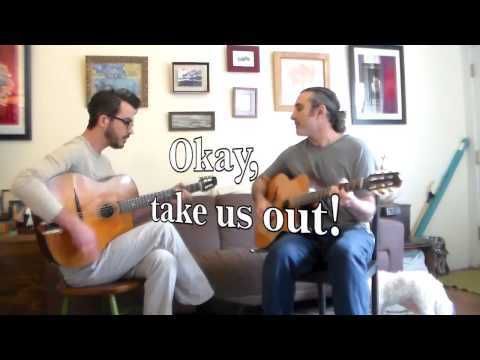 This week's song, Coquette. Well that was a lot of fun - irresistible! Thanks, Anthony, you're really on a roll this week. By the way friends, I found that when I played along with the video, I found it fun and easy to solo, but playing rhythm was a bit challenging because I couldn't hear the rhythm guitar over my own. anybody find that the case? I'm thinking the next video I will try to have an extra person there playing rhythm the whole time. Maybe even have my basist there as well. Hey that WAS fun! Thanks! i haven't tried this yet, but i know that i would run into that same issue when playing rhythm. this can be resolved a bit more easily by listening through headphones or playing much quieter! This is a great idea, Anthony! How about inserting arpeggio/scale sub titles as reminders for budding soloists during the viewer chorus chord changes? Hey guys, check out that I added another online Jam video to the original post! Very nice!!! How about adding a bass in future jams? Keep 'em going!!! Bass is good. Rhythm in Gitane ...hmmmm...you have basic pompe and second rhythm pattern driving the bus.....too much going on IMHO.....sometimes it works with the solo sometimes I feel it is competing with he solo...not having a conversation.